(Corona, CA, April 30, 2014) – Corona announces the expansion of its brand into Europe through its partnership with Bellota Herramientas. For more than a century, Bellota has established itself as a leading manufacturer of hand tools used in agriculture, gardening, construction, and landscape markets. Garden centers and tool merchandisers may now offer a select line of Corona branded tools and accessories targeted at casual gardeners and the Do-it-Yourself (DIY) market for distribution throughout Europe and other select foreign countries. The gardening line includes Corona’s ComfortGEL and Dual Cut pruning tools in addition to other popular models, long handle tools, garden hand tools and garden accessories. The new Corona branded DIY line includes masonry hand tools for household projects and tools for general repairs. For a complete listing of tools or to get more information or register to become a reseller, visit the CoronaToolsEurope.com site. Founded in the early 1920s, Corona is a leader in the marketing and manufacturing of professional and consumer tools for the lawn and garden, landscape, irrigation, construction and agriculture markets. With a retail and distribution network that extends throughout the United States and Canada, Corona’s proven designs, quality manufacturing processes and unparalleled customer service make it the best choice in tools for contractors, agricultural professionals, master gardeners and avid gardeners alike. For more information, visit www.coronatoolsusa.com. 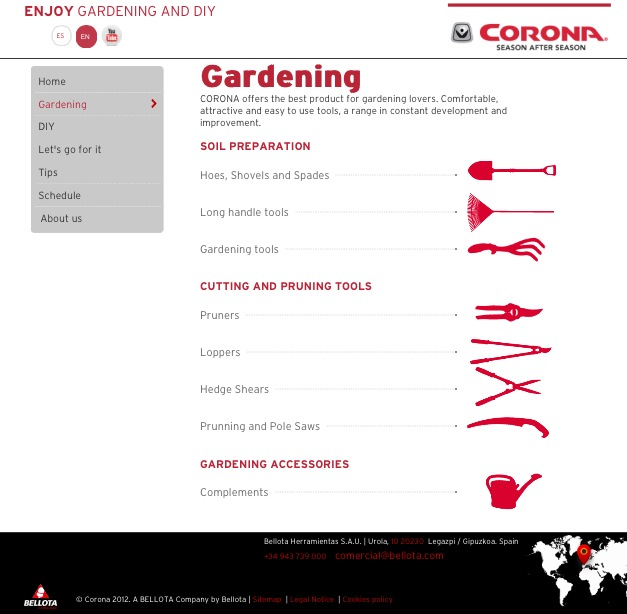 Find Corona Tools on Facebook, Twitter, YouTube and download the Corona Tools garden app for both Apple and Android devices. Bellota is a leading brand and manufacturer of tools and agrisolutions for professional workers since 1908. Serving the construction and agriculture industries, Bellota has extensive distribution in 121 countries.